I had planned to sleep in until 7am, but was awake at 6:30am and got up. The campsite was in a shallow valley where there had been rain overnight and a heavy dew and it didn't look like the sun was going to reach it for a while, so I sort of dawdled over breakfast and packing up but finally gave up on the sun and packed and left with a wet tent at 9am. My pack now had five days of food in it so was a lot heavier than yesterday, but it was a beautiful morning for walking along the foot trail through the sun-dappled forest in the cool morning air. 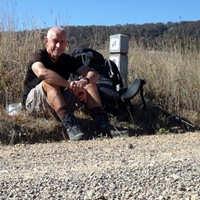 The morning's walking continued like this, passing through eucalypt and pine forest on a mix of forest roads and foot-trails following shallow valleys and crossing broad clearings. It was just magic and I forgot about the increased pack weight. Towards noon the trail climbed higher and higher to reach a broad mountain shoulder where I had mobile phone coverage so I took an hour off in the sun to post my diary to the web and dry out my tent and parts of my sleeping bag after last night's rain and dew. It would have been easy to stay longer, but I still had a fair way to go. The next few hours were also exceptional walking. For a while the track followed a narrow forested ridge with occasional spectacular views to the south, east and north. Then there was a gradual but exhilarating descent across the face of a steep open grassy mountain where I had continuous views in multiple directions. Far below was a road along which passed a number of large logging trucks going to and from the forests somewhere and straining loudly up the hills. Finally the track descended to the valley floor and crossed private farmland to a creek where I looked in vain for the usual snazzy Hume & Hovell Track suspension bridge and finally manouvred my way across a series of rocks balancing with the aid of my trekking poles and thankful for my high profile Goretex boots. There followed more pastureland walking which was occasionally difficult to navigate because the cows seemed to have enjoyed knocking over the little white posts (possibly good for scratching). Yesterday's long walk together with today's heavy pack began catching up with me around 3pm and I was looking forward to reaching the campsite. This fatigue probably coloured my view of some of the last kilometres which were pretty much cross-country following Lankeys Creek upstream through cow pasture. The stream meandered around, it was sometimes difficult to negotiate steep banks, and the setting sun was directly into my eyes making it diffcult to see where I was going. I made slow progress and it was 4:50pm before the trail crossed the creek and joined the road which was on the other side. After another 3km I reached the Lankeys Creek Campsite, partly damaged by a recent flood, in rapidly diminishing light. Adjacent to the Campsite is a private property with a number of old rail carriages being used as accommodation. This would be the Lankeys Creek Bunkhouse which, by reputation, has been a welcome stopover for previous H&H hikers. However, I hadn't called ahead and, now that it was dark, I couldn't be bothered making contact and investigating the possibility of unbooked accommodation. At the end of another long day, I just wanted to set up camp, eat and go to bed, so that's what I did on what was becoming a very cold night with a sharp breeze. After doing my diary, I headed gratefully for bed at 8:30pm. Quite a lot of rain is forecast for the next two days.